Sometime in early 2002 I attended a meeting of people interested in creating an historical society. The call had been put out by our now Mayor Barry Greenberg. Back then he was, correct me if I’m wrong, Mayor, the Chairman of our Historic Preservation Commission. The meeting was held in a building owned by the Sunnen Corp. where the Chamber of Commerce/Maplewood Community Betterment Foundation met in those days. I believe Deb Faber had recently assumed the role of director of the Chamber with the lovely Theresa Fuchs assisting. I have not heard from Theresa in quite awhile. I hope she is doing well. Theresa was an enthusiastic community booster. She saved whatever historic material she discovered regarding our community. I recall looking through her collection. Though my interest in the subject hadn’t yet matured there was a photocopy that stuck in my mind. It had been sent by someone in the Sutton family. 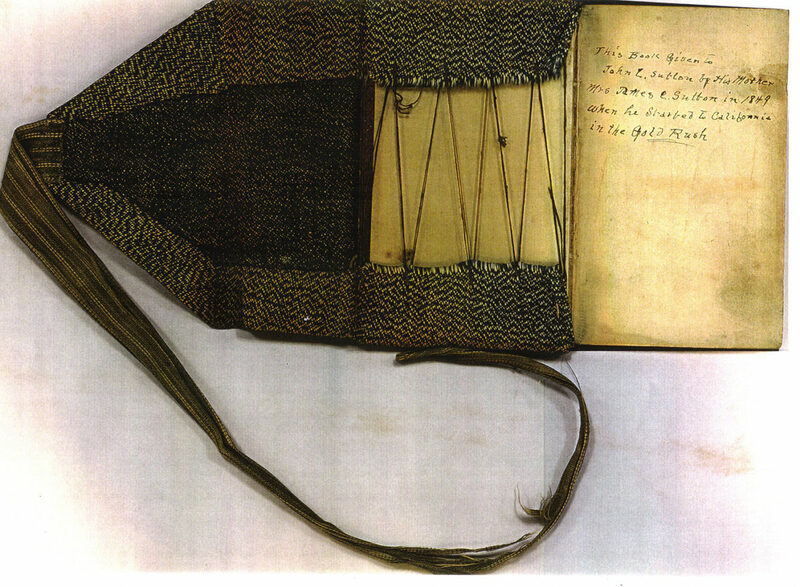 It was an image of a wallet that had once belonged to a Sutton. I only remembered that it had something written on it such as”located seven miles from St. Louis on the Manchester Road”. Seems like it was a couple of years later when the Chamber got kicked out of that building. Everything our infant society had collected by then would have gone into the trash had not Linda Kurtz and I rescued it. We moved it to the basement of Barry’s architectural firm (ADG) on Sutton. Over time I moved everything worthwhile from there to the Maplewood Public Library’s collection. Somewhere in the shuffle the image of the wallet was lost. Recently Dan Shelton contacted Doug Miner after seeing some of my posts about the Suttons. Dan is the owner of the wallet and more. What was lost is now found. The search is still thrilling. The image that stuck in my mind 16 or 17 years ago. 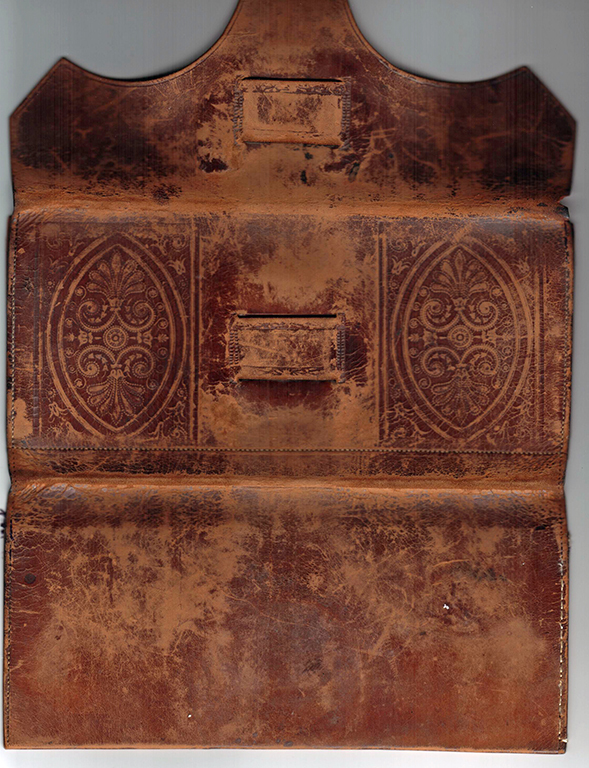 The outside of the wallet. A closeup of the maker’s mark. Note the Bartold Valley post office address. The nearest post office was at Bartold’s Grove in the Bartold Valley. That location today is Hanley Road at Manchester Road. How is this for a prize? Also included in Dan Shelton’s collection is this bible. 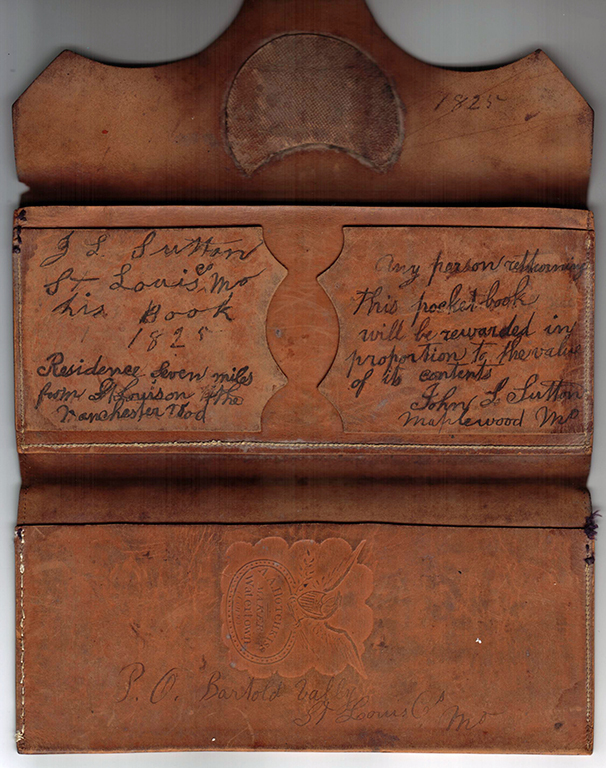 As you can see it was given to John L. Sutton by his mother (Ann Wells Sutton) when he left to find his fortune during the gold rush of 1849. 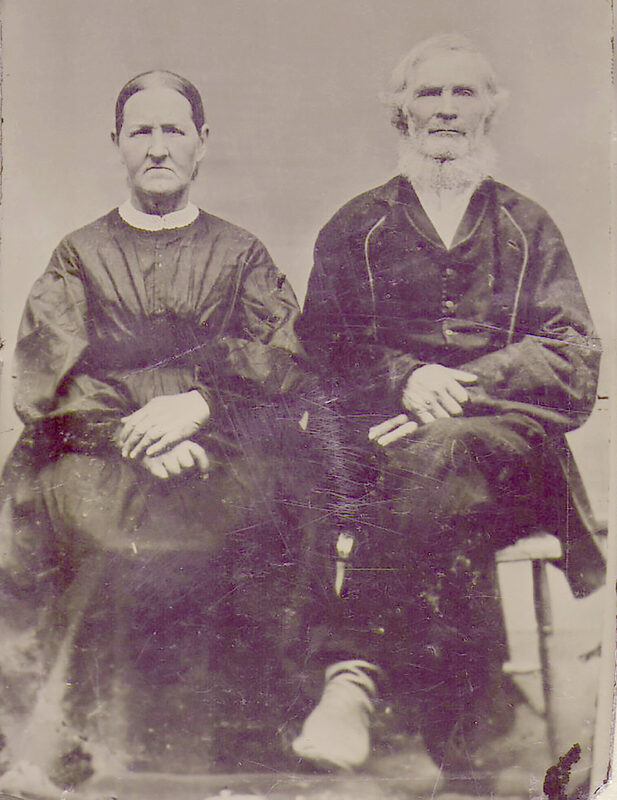 John L. was the oldest child of James C. and Ann Sutton. He was born about 1830. After he had his son who was named John L. Jr., he is usually referred to as John L. Sr. I was struck dumb by this image. Well, I was dumb to start with but you get the idea. 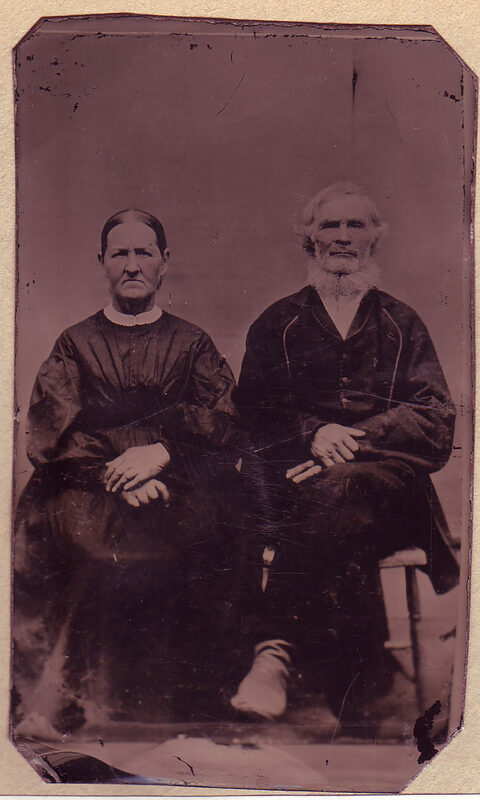 This copy of a photograph of James C. Sutton and his wife Ann L. Wells Sutton is a sort of holy grail to me. I only know of one other image of James and I think there are only two of Ann. The same image after a little Photoshopic attention. I looked long and hard at these two people about whom I have read so much. The more I learn about them the more questions I have. I’ll conclude with this great article that Dan included with his Sutton images. I had read this same article in one of the Thomas scrapbooks lent to me by Chrissie Hayes McConnell. It’s a wonderful article. Getting bit by a mad dog must have been a fairly common thing in those days. I have to wonder what ever became of the mad-stone? I want to thank Dan Shelton for allowing us to have a look at these amazing items that he has preserved. They are fascinating to consider. I believe we all take great pride to be able to add these images and details to our collective knowledge of our shared history. Why don’t I receive your newsletter anymore? I don’t have any idea. Who are you? I’m wondering what the area where the Missouri Pacific tracks go over Big Bend looked like in the past? When was the area changed and are there any photos of this area in its different iterations? Here you are, Bill. This post has everything I have on that subject except when was the area changed. I’d guess about 1960. 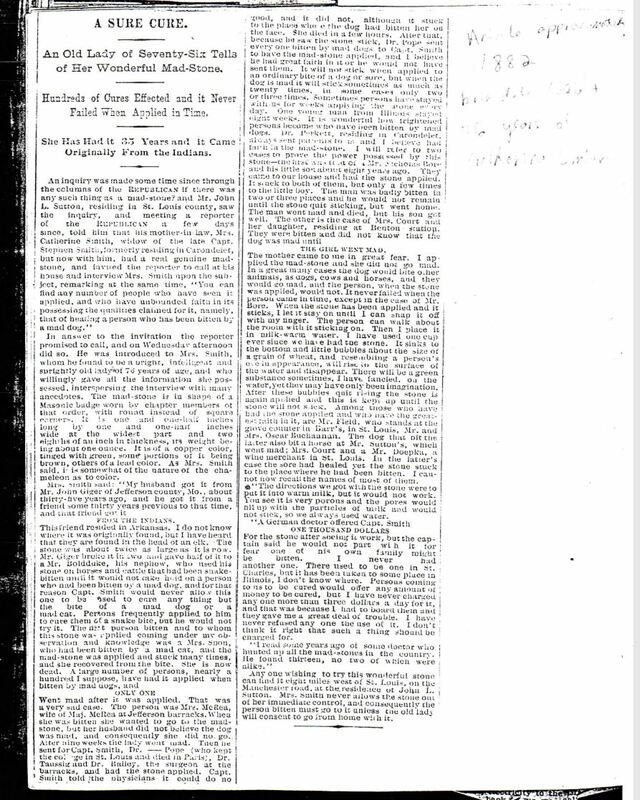 Any connection between the Llewellyn resturaunt and the Sutton family? Such an unusual spelling it made me wonder. I mean Webster Groves is not that far away? Maybe some distant relative started it and named it after a family member? I am surprised at how much has been kept and still survives of the historical pictures and records. Having just gone thru a family member’s death and going thru their things I was both saddened and shocked by how much no one had an interest in, no one wanted that old stuff. I am sure that for some it was lack of interest, for others the lack of space to store or display it, some items no one seems to know anything about it or why it is in the family, for others it could have been a painful reminder that someone is gone. What a treasure we have in all that you have shown us. Llywelyn’s Pub has no connection to Maplewood. Originally called Llywelyn ap Gruffydd, it was started in the Central West End in the 1970s by the late Jack Brangle and is named after the last sovereign prince of Wales, who died in 1282. Hey Mark, You are right. A lot of good stuff gets pitched. No one is more surprised than me at how much historic material related to Maplewood keeps turning up. I have been looking for these images and documents for quite a long time. Beginning in 2002 with the historical society, 2007 for the first book and blogging since 2010. This is the 225th post on 40 South News since Oct. 2013. There are probably around 300 posts all total, most with at least 6 photos and some with 16. There must be about 3,000 images that I have posted and they keep showing up. Amazing! The blog is a wonderful vehicle for this. It is all due to these very nice folks who learn of this effort and want to share their family history with the rest of us. I take my hat off to them. In my case some of the issues was how to get it back home without spending a lot of money for some items that they weren’t sure they wanted. For some it was that it does not fit in with their decor. For some I am sure it was a reminder that our family had lost someone dear to us. My wanting to keep it was for the continuation of having that stuff in the family, that someday we would be wondering what happened to it, why we gave it away or trashed it. Maybe it is just my make up but emotional times like these occasions I find it best to give it some time to wait for a while to make a decision about things that might be important to the family. Not everyone has that time but at least in my family there was no reason to do a full toss out of things. Between one or two of us we grabbed most of it but I suspect that some was already tossed before we got there. 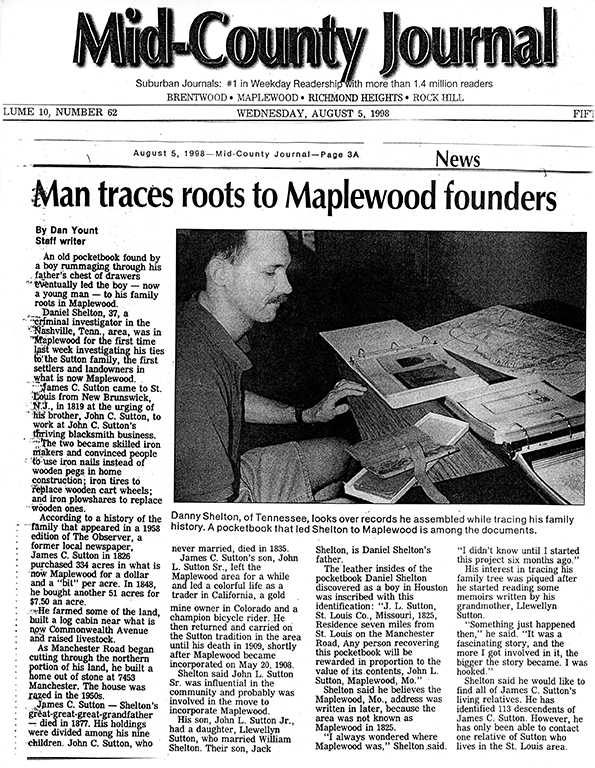 Good Job Doug, You’re Da’ Man, when it comes to Maplewood history. Interesting stuff and important to preserve for future generations. Thank you for the vote of confidence, Mr. Smith. I appreciate it.